When we stick to our guns, who pays the price? Steppenwolf for Young Adults 2016/17 season features two plays in conversation with one another exploring how we participate in the culture of violence that surrounds us through our beliefs and convictions. The season opens with the world premiere of The Burials, by Caitlin Parrish and directed by Erica Weiss and is followed by the world premiere adaptation of Walter Dean Myers's critically acclaimed novel, Monster, adapted by Steppenwolf Artistic Producer Aaron Carter and directed by Hallie Gordon. Through these two stories, we will investigate the aftermath of tragedy – through a community’s response to a mass shooting and one teen’s journey to understand himself in the face of a culture of violence. Sophie is everything an upstanding young millennial should be: engaged, devoted to her family, and a likely valedictorian. But her life is shattered when her brother goes on a high school shooting rampage. Thrust into the national spotlight, Sophie finds herself torn between defying the narrative being woven about her brother in the media, and stopping the father she loves from using the rampage for his own political ends. Inspired by Antigone, The Burials is a modern tale of civic responsibility and the gun epidemic in America. Sophie is everything an upstanding young millennial should be: engaged, devoted to her family, and a likely valedictorian. But her life is shattered when her brother goes on a high school shooting rampage. Thrust into the national spotlight, Sophie finds herself torn between defying the narrative being woven about her brother in the media, and stopping the father she loves from using the rampage for his own political ends. Inspired by Antigone,The Burials is a modern tale of civic responsibility and the gun epidemic in America. 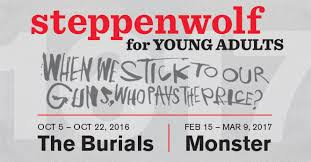 Steppenwolf for Young Adults (SYA) begins its 2016/17 season with The Burials, a world premiere by acclaimed playwright Caitlin Parrish, directed by Erica Weiss. Inspired by the enduring Greek tragedy, Antigone,the production explores the aftermath of a mass shooting and how one family and one community respond to the tragedy in unique ways. SYA curates numerous workshops, residencies and post-show events to engage both students and adults in the conversation. Public performances are October 8 (3pm and 7:30pm), October 14 (7:30pm), October 15 (3pm), and October 22 (3pm and 7:30pm). School performances are Tuesday through Friday at 10am and are reserved for school groups only. The press performance is Saturday, October 8 at 3pm. A study guide is available online here. Tickets to public performances ($20; $15 with student I.D.) are available through Audience Services (1650 N Halsted St), 312-335-1650 andsteppenwolf.org. SYA Artistic Director Hallie Gordon comments, "Given how hauntingly familiar this type of violence is, by relating the enormity of a story like Antigone to the epic nature of gun violence, we aim to ask how each of us can help to imagine a world without this type of tragedy and how we can inspire young people to help us lead the charge in doing so." "We wanted to take this story, which is a story about young people, and make it epic. We wanted to give young people a voice and elevate it," says director Erica Weiss. "We were privileged to be able to go to high schools around Chicagoland and talk to students about what their experiences have been growing up in a country where gun violence, and specifically school shootings, is a very real possibility. It was important for us to reflect and listen to the way that students experience this reality," shares playwright Caitlin Parrish. The nine-person cast includes Aurora Adachi-Winter, Stephanie Andrea Barron, Joel Boyd, Olivia Cygan, Matt Farabee,Coburn Goss, Ty Olwin, Becca Savoy and Kristina Valada-Viars. The Burials production team includes Courtney O'Neill (scenic design), Alarie Hammock (costume design), J.R. Lederle(lighting design), Matt Chapman (sound design), Joseph Burke (projection design) and Rachel Flesher (fight choreographer). Additional credits include Tess Golden (stage manager) and JC Clementz and Tam Dickson (casting) andHallie Gordon (artistic producer). Caitlin Parrish's career began at age 18 when she won the 2003 National Young Playwrights Competition with her first playThe View from Tall, which subsequently ran Off-Broadway. Her most recent plays, created with frequent collaborator Erica Weiss, include A Twist of Water, The Downpour and The Burials. A Twist of Water (Route 66 Theatre Company), also enjoyed an Off-Broadway run at 59E59 and was nominated for Best New Work at the Joseph Jefferson Awards. The Downpour also received a Best New Work nomination at the Jeffs, and both plays were named finalists by the American Theatre Critics Association for the Steinberg Award for Best New American Play. Her work in television includes stints as a writer for Emily Owens, M.D., Under the Dome and Supergirl. She is a recipient of the prestigious Humanitas Award for her original television pilot Painkiller. Her pilot Red Line has been optioned by Warner Brothers television. The film adaptation of The View from Tall(written by Parrish, who co-directs with Weiss) recently played the Los Angeles Film Festival. Erica Weiss is a Jeff-nominated theatre director and filmmaker based in Chicago. She was the recipient of The Goodman Theatre's Michael Maggio Directing Fellowship, is a proud ensemble member of The Gift Theatre Company and was the Associate Artistic Director of Route 66 Theatre Company for four years. She recently directed the Gift's critically acclaimed production of The Grapes of Wrath. Her primary passions lie in the development of new work and bringing female voices to the stage and screen. Her directing work includes the world premieres of Jerre Dye's Cicada (Route 66 Theatre), Danny Bernardo'sMahal (Bailiwick Chicago) and the currently running Chicago premiere of Caroline V McGraw's The Bachelors (Cole Theatre). Weiss is a longtime and frequent collaborator with writer Caitlin Parrish, directing their world premiere productions of The Downpour (Joseph Jefferson Nominee for Best Production, Best Director, Best New Work and Best Lead Actress) and A Twist of Water with Route 66 Theatre Company and Off-Broadway at 59E59. She and Parrish co-directed their first feature film The View From Tall with their company Teleporter Productions. She directed Jerre Dye's new play, Distance now playing at Strawdog Theatre through October 1. The Steppenwolf Young Adult Council, an afterschool program for teens interested in careers in the arts, will host The Scene, an event where teens from throughout the Chicagoland area see the show with their peers, attend an artistic discussion and after-party. The Scene will take place Saturday, October 15 following the 3pm performance. 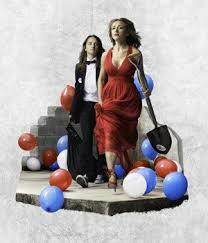 Tickets are $10 and available atsteppenwolf.org or 312-335-1650. New this year, SYA hosts STEP IN, a series that offers teens from all over the city the chance to participate in hands-on theatre workshops alongside some of the most exciting theatre artists while learning more about the Steppenwolf Young Adult Council. STEP IN events are open to high school students and are offered free of charge. Upcoming dates Wednesday, November 9from 4:30pm - 6:00pm in The Garage Theatre and Wednesday, December 7 from 4:30pm - 6:00pm in The Garage Theatre. The Steppenwolf Associates, a collective of more than 150 young professionals, will host Unlocked: The Artistic Process in support of SYA. Featuring festive drinks and hors d'oeuvres, followed a riveting performance of The Burials and an exclusive conversation to discover how Steppenwolf playwrights, directors, teens and teachers create gripping, timely art, Unlocked takes place, October 22, 2016 at 5:30pm. Tickets are $75, which includes show admission. In conversation with The Burials and the SYA 2016/17 season theme, "When We Stick to Our Guns, Who Pays the Price? ", SYA's second production will be the world premiere of Monster, based on the novel by Walter Dean-Myers. The production, adapted by Aaron Carter and directed by Hallie Gordon, will run February 15 - March 9, 2017 in the Downstairs Theatre. Following the run at Steppenwolf, SYA will tour Monster to three juvenile justice facilities in Illinois, working in partnership with Storycatchers Theatre to bring the production and complementary workshops to detained and incarcerated youth. Major foundation support for Steppenwolf for Young Adults is provided by the Polk Bros. Foundation and Paul M. Angell Family Foundation. Steppenwolf for Young Adults is also supported in part by contributions from The Crown Family, Alphawood Foundation, Lloyd A. Fry Foundation, Northern Trust Company, Field Foundation of Illinois, Dr. Scholl Foundation, the Helen Brach Foundation, ADM Cares, Siragusa Foundation and Robert and Isabelle Bass Foundation, Inc.; as well as Steppenwolf Associates, a community of dynamic young professionals. Steppenwolf for Young Adults' unique approach combines play production with educational components to enhance arts education for young audiences, as well as their teachers and families. SYA creates two full-scale professional productions each season specifically for teens. Working closely with the Chicago Public and metropolitan area schools and other community partners, SYA annually ensures access to the theater for more than 15,000 participants from Chicago's diverse communities. The initiative also includes post-show discussions with artists; classroom residencies led by Steppenwolf-trained teaching artists in almost 100 classrooms in public high schools; professional development workshops for educators; and the Young Adult Council, an innovative year-round after-school initiative that uniquely engages high school students in all areas of the theater's operations. Steppenwolf Theatre Company is America's longest standing, most distinguished ensemble theater, producing nearly 700 performances and events annually in its three Chicago theater spaces-the 515-seat Downstairs Theatre, the 299-seat Upstairs Theatre and the 80-seat 1700 Theatre. Formed in 1976 by a collective of actors, Steppenwolf has grown into an ensemble of 46 actors, writers and directors. Beginning in 2016/17, Steppenwolf expands artistic programming to include a seven-play Season; a two-play Steppenwolf for Young Adults season; Visiting Company engagements; and LookOut, a new multidisciplinary performance series. While firmly grounded in the Chicago community, nearly 40 original Steppenwolf productions have enjoyed success both nationally and internationally, including Broadway, Off-Broadway, London, Sydney, Galway and Dublin. Steppenwolf has the distinction of being the only theater to receive the National Medal of Arts, in addition to numerous other prestigious honors including an Illinois Arts Legend Award and 12 Tony Awards. Anna D. Shapiro is the Artistic Director and David Schmitz is the Managing Director. Nora Daley is Chair of Steppenwolf's Board of Trustees. For additional information, visit www.steppenwolf.org,facebook.com/steppenwolftheatre and twitter.com/steppenwolfthtr.